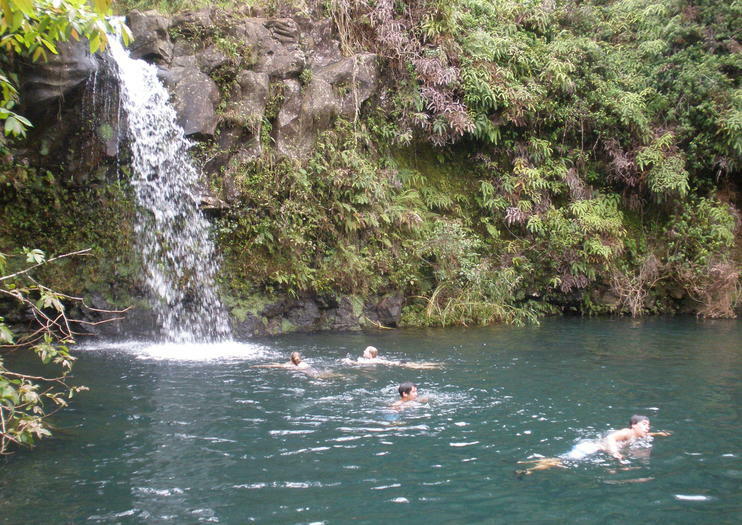 A pleasant stop on the road to Hana, the Puaa Kaa Park offers the chance to take a scenic break from the long drive. Stretch your legs on its dirt path to nearby waterfalls and natural pools. The farther you're willing to walk, the taller the waterfalls become and many people bring a picnic to enjoy as a part of this diversion. Totaling five acres the area here is lush with tropical plants which, with the sound of the waterfalls, create a distinct rain forest feel. Picnic tables are set against scenic backdrops, and fish and tadpoles are visible in the shallower pools. Watch for wild birds and mongoose. The walking paths here are not rigorous, but a refreshing dip in one of the pools is a highlight for many on a hot day. Puaa Kaa State Wayside Park is just past mile marker 22 on the Hana Highway (Road to Hana). It is open daily from 6am to 6pm, and there are parking and restroom facilities. The Road to Hana is one of the most famous drives in the world, and for good reason. It’s a 64-mile stretch of two (and often one) lane road that cuts deep into Maui’s lush rain forest as it winds along the north shore coastline. This 4-hour long Halfway to Hana Tour features some of the Road to Hana’s most memorable sights. With waterfalls plunging down into the jungle from high above, splashes of brilliant floral colors, breathtaking coastline vistas, and even a bamboo forest you can explore, it’s no wonder this is one of the most popular “bucket list” excursions in the world. As you watch it all unfold before your eyes, you will learn about the rich history of Hawaii, its colorful people and ancient legends told like no one else tells it.